The Outlaw Rogue specializes in sustained damage, as opposed to just burst, making it great for PvE and not at all bad for PvP. You have more weapon flexibility and are better against multiple targets than other Rogues. In Legion you’re practically brand new. New flavor, new “fantasy,” no abilities and old ones dead. You used to be Combat, now you’re the classic Rogue, an Outlaw. Or a Pirate. Or a Swashbuckler. Or all those and more. This page is updated for Warlords of Draenor and Legion updates are coming soon. This Outlaw Rogue guide is primarily intended for use at level 110, in dungeons and Raids. However, the principals will still apply during the leveling process, so if you’re looking for advice on leveling your Rogue you should check out our Rogue Leveling Guide. In Legion you can swap entire builds any time that you’re out of combat. Want to raid as Outlaw and switch to Assassination for one fight and Subtlety for one other? No problem. Just switch specs any time that you’re out of combat. Oh, you want to switch the actual talents? You have to be in a rested XP area, so an Inn of the big city. You do not need a trainer to switch and you now longer have to go to a trainer to get the “Dual Spec” ability. You can now freely switch, anytime that you’re out of combat, between the specs. Swordmaster – Your Saber Slash will strike a second time a bit more often (+10%) than before. This will also generate more free Pistol Shots. Quick Draw Those free uses of your Pistol Shot, generated from your Saber Slash, will now do more damage and generate an extra CP. The extra damage and the CP make this the best pick, for pretty much any type of fight. Grappling Hook – A fun little talent. Target a location, toss the hook, and get pulled to that spot. More like the Warrior’s Heroic Leap than a Rogue’s Shadowstep. You can grapple to any spot that you can run to, which does not include grappling to the tops of buildings, though you can grapple from the top to the ground. You cannot use it to cross gaps that you can leap across. Usable in stealth and does not break stealth. Mice for that 40 yard burst movement. Hit and Run – +15% movement speed at all times. Stacks with your Fleet Footed. And you can always use Sprint when you need to dash about. Deeper Stratagem – Passive. You can now store and use up to 6 CPs on your finishers, plus your finishers do 10% more damage. This is, overall, the best pick for max damage. Vigor – Passive. 50 more energy and 15% faster energy regen. Nice for burst, esp. if you’re feeling energy starved. If you’re good at energy management then definitely go Deeper Stratagem. Iron Stomach (sounds like a Monk ability.) More healing from potions, your Vial, and healthstones. More of a solo talent than a raiding/PvE talent. Even then, Elusiveness is pretty nice. Elusiveness – Passive. Your Feint now works for all damage, reducing it by 30%. It still reduces area damage by 50%. Pretty useful general damage reduction. Cheat Death – Passive. Yes, Rogues cheat. If you’re hit with a one shot kill you will instead be reduced to 7% health and take far less damage from all attacks for three seconds. Won’t happen more than once every 2 min. If you’re not sure of the fights and/or you might well be facing Rogue Squishing damage, then this is a good pick. Prey on the Weak – Passive. After you use certain incapacitating strikes your opponent will take 10% more damage from all sources. Kidney shot, Cheap Shot, Sap, and Blind (Assassination no longer has Blind.) Nice for those times when that add just has to die now. Cannonball Barrage – Nice little area effect. Your Ghost ship bombards the area for good damage and briefly slows the enemy. Hits like a ton of, well, cannonballs. Alacrity – Your finishers have a chance to add 1% Haste, possibly stacking up to 20 times. Obviously this is best if you’re continuously attacking and you have a single target. Death from Above has a 15 yard range, hits all mobs around you, and drops your Run Through on the main target with 50% bonus damage. Decent gap closer with the 15 yard range. Well, there aren’t any. Not really. You can get a few that are purely cosmetic, but there are none that have any effect on anything you do in any combat. Glyphs are easily changed. Just pick the new one you want, spend one tome of the clear mind, and slot the new one. Easy. Depending on the fight you might want to do a bit of switching, so have a stack of those tomes handy. Glyph of Energy provides 20 more energy. Does not stack with the Venom Rush increase. Glyph of Disappearance allows for more Vanishes, increasing overall damage. Glyph of Cloak of Shadows – A survivability glyph which might be very useful in situations that have large physical damage. Glyph of Feint – A nice survivability glyph. Glyph of Blade Flurry – This will provide a more frequent application of your non-lethal poisons. Glyph of Shiv – Reduced cooldown = more shivs. More chances to reduced enrage effects or apply the Shiv effect of your poisons. Glyph of Deadly Momentum – Useful for any fight with trash/adds. Kills will refresh both Slice and Dice and Recuperate, saving valuable Combo Points. Glyph of Evasion – Also for survivability, though less useful than Feint. Glyph of Sprint – Increased movement speed, but does nothing for the cooldown. Useful when quick movement is needed. Glyph of Kick – Not useful unless you’re the one on interrupt duty. Cooldown is increased if the Kick isn’t successful. Glyph of Poisons – Fast poison application is always useful. Glyph of Killing Spree – More predictable positioning. Note that not having your blades poisoned is a much larger DPS hit than having your stats “just so” Also the values of Haste, Mastery, and Crit are pretty close. 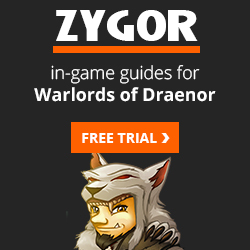 In Warlords Hit, expertise, and reforging are all read. You have one new stat: Versatility (improves offense and defense.) You also have an “Attuned” stat (Haste, in your case) which is intended to be the “best” stat for “throughput.” Damage, for Rogues. This gives you +5% Haste from all sources and comes with your Outlaw Potency ability. In Legion Multistrike and Attuned Stats are gone. Haste gives you more strikes, faster energy regen, and faster poison ticks. Your Combat Potency ability gives your off-hand attacks a chance to return energy. More Haste also gives you more attack while under the effect of buffs, such as your Bandit’s Guile. Basically, more Haste = faster energy return through regen and through more off-hand procs. Multistrike gives you a chance at two additional strikes at 30% effectiveness. These strikes can crit and can proc poisons and, via Outlaw Potency, can proc an energy return if the off-hand strike Multistrikes. Blade Flurry works very well with Multistrike. For the chance at two multistrikes, multiply the % chance by itself. So if you have 20% Multistrike you multiply .20 x .20 to get .04. A 4% chance to actually get both multistrikes to fire. Mastery gives you a chance for decent hits with your off-hand. These off-hand hit can crit and can return energy due to your Outlaw Potency. Crit doesn’t proc anything, it just does extra damage. Versatility improves your damage and your defense. Stacking stats, now that reforging is dead, is done the old fashioned way. Gems, enchants, and gear selection. New enchants for the various secondary stats can be applied to rings and neck pieces, there are no new enchants for Agility. In Warlords Tricks of the Trade no longer gives your target a damage add, it simply transfers threat. Since threat isn’t likely to be an issue you should be able to ignore this ability, though it will allow you to attack first and transfer your threat to the tank. Poisons are now Assassination only. You want to avoid being energy capped (energy at 100%) as it means you’re not using your attacks. Conversely, blowing everything means that you might not have enough energy to do that next move. Try to keep enough energy to do something without letting it hit 100%. Various abilities and effects, such as Adrenaline Rush and Heroism, will allow you to spam abilities without running out of energy. The same applies to Combo Points. Once you have your 5 then do something with them. If you have the Anticipation talent then your max is ten and you need to do something with them. Get into stealth and take your chemicals (Draenic Agility Potion) immediately before the fight starts. You can take the potion during the fight later on. Ambush should be used as your stealth opener. Get Slice and Dice running with 5 CPs. Adrenaline rush after Killing Spree. Sinister Strike is your primary attack outside of stealth. Apply and maintain the Revealing Strike debuff on your target. Maintain Slice and Dice at all times, preferably with 5 combo points to make maintaining your rotation easier. Use Run Through when you have 5 combo points. Marked for Death can give you another 5pt Run Through. Vanish on cooldown to get another Ambush. Sprint as necessary to stick to your opponent. Bandit’s Guile cycles without your input. It starts at 0%, then 10, 20, and 50% (with your perk. )It then resets to zero. Four uses of your Sinister Strike will advance it to the next stage. You can use Revealing strike to delay that advance, if you need to be off your target for a few seconds. If you can time your strongest finishers and cooldown to align with your peak Guile then you will do a lot of damage. When facing small groups of targets use Blade Flurry and maintain your single target rotation. Marked for Death (if you took it) will refresh as your opponents die. You can use it to refresh Slice and Dice or for another Run Through. Note that you get a cooldown reduction, from your Ruthlessness ability, whenever you spend Combo Points. Adrenaline Rush should be used on cooldown for maximum effectiveness, preferably with the Glyph. It stacks with Heroism type effects for added burst. Killing Spree should also be used on cooldown, but after you’ve used the majority of your energy as during Killing Spree you will be unable to use any abilities making it an ideal time to regain lost energy instead. You should have Blade Flurry up if using Killing Spree vs multiple opponents. Combat Potency gives your successful off-hand melee and Main Gauche attacks a chance to generate 15 energy. Bandit’s Guile provides a steadily increasing damage followed by a drop off as you shift from one buff to another before they vanish altogether and the cycles starts anew. Tricks of the Trade puts 6 seconds of aggro on the other guy. If you tank has problems keeping threat then this will be a good thing to use while bursting. Feint, Cloak of Shadows and Evasion are all potent survivability tools which should be used when you feel them necessary. Feint will allow you to tank AoE effects to an extent, the glyph extends its duration. Note that Mists of Pandaria gems with secondary stats, such as Haste, have twice the value of those with Agility. In Warlords the stat squish is in. Your gems have much lower values then before, though their relative value to the rest of your gear should be similar. For example, gems that used to be 320 Haste are more 20. Gems that previously had Hit now have Crit, those gems that had Expertise now have Haste. Meta: sockets: Agile Primal Diamond until you can get Capacitive Primal Diamond. Go here if you need to gold to get all of your gems. Gems sockets are actually few and far between, especially on PvP gear. Currently none are actually available, but perhaps they will be as the expansion progresses. They have a (small) random chance to appear on Raid gear, so perhaps they’ll also appear on PvP gear and other items as well. Also, there are no meta gems or sockets, there are no socket bonuses, and all sockets are “prismatic,” which means that they will take any available gem. Outlaw Rogues should gem for Haste. In Warlords there are no more profession enchants, but you can enchant your rings and necklace items. Use Agility or Haste enchants where you can. Warlords Notes: There are no head enchants, all shoulder enchants come from the Inscription profession and are only for items under items level 600. There are new enchants for Neck, Cloak, Weapons, and your Rings. Not for any other pieces. (Not yet, anyway.) There are no more profession enchants. Enchants that had Hit, before WoD, now have Crit instead. Enchants that had Expertise now have Haste. Pandarens can become Rogues., the only races that cannot be Rogues are the Draenei and the Tauren. Maybe it’s the horns? In Warlords any racials that gave Hit or Expertise have been removed. In most cases they were replaced with something just as useful, but the Orcs got nothing in exchange for losing their expertise with axes. Being Bouncy means that you take less falling damage. Not much use in most PvE envoronments. Can stun a melee opponent for four seconds, with a strike of your paw, er… hand. Another stun is always a good thing. You get better bonuses from food buffs, which will add another 300 Ag to your top food buff. Naturally you’re good with Cooking. Your raid might appreciate that. Longer lasting rest XP means slightly faster leveling. You may choose either Horde or Alliance upon leaving the Pandaren starting area. DPS: Orcs, Trolls, and Goblins all have abilities which will increase their damage in PvE content. Orcs and troll raicial are cooldowns, so are great when put into macros. Increased Haste is a small DPS increase. Rocket jump is much like the Mage’s “Blink,” and has definite escape use in PvP and certain PvE situations. It breaks stealth, so it’s not a cheap “Shadowstep,” but then again, Outlaw Rogues don’t necessarily need to attack out of stealth so it can be a nice “enter combat” skill. Blood Fury provides a comparable, or better, DPS increase than the Landslide enchant. Resistance to stuns has definite PvP use and occasional PvE use. A decent DPS cooldown, Berserking, provides 20% attack speed (this is not haste, which would give you more energy regen) every 3 minutes which can be used in conjunction with every Vanish. Beast Slaying is great for leveling with its +25% XP for slaying beasts. Arcane Torrent generates some energy every 2 mins. and does an AoE silence (also interrupts non-player targets.) This gives it both PvP and PvE use. Nice when fighting caster trash. Will of the Forsaken has definite PvP value and could allow you to deal some extra damage or trivialize a mechanic for some bosses. Touch of the Grave drains life and heals for the same amount. It’s a passive ability and will add a bit to your DPS totals and help your healers slightly. Indefinite underwater breathing will have some use in the open world, but probably not much in raids. PvE: The Worgen have the best DPS increasing ability, while Gnomes, Dwarves, and Humans have some form of Expertise with certain weapons. the 1% add to crit rating is an Ok DPS racial and has similar PvP utility, but Crit is your weakest stat. The run speed special is nice. Extra speed is always useful. A bit more Agility and a bit harder to hit both have some small value. Shadowmeld has some use as an extra “Stealth,” except that you’ll be stationary. It drops aggro, so there are certain situations where it can help. Slightly faster movement while stealthed is of more use to Sub and Assassination. +1% Crit by day and +1% Haste by night. Diplomacy is nice if you’re grinding for rep with any of the zillion factions in the game. The Human Spirit adds to your Versatility stat. Stoneform has PvP value and might have occasional PvE value. It washes away bleeds and reduces damage by 10% for the duration of the effect. Some macros for your amusement. Note that ‘target=blahblahblah’ and ‘@blahblahblah’ do the same thing. This one combines the @focus and @mouseover. If there is no focus or mouseover then it will transfer threat to the target of your target. This will be the tank if you’re fighting the boss and it might be you if you’re fighting some add before the tank gets its attention. Mouseover a target and hit the Blind button. If there’s no target under your mouse then it will blind your current target. If that target might have a DOT on it then your Blind should be glyphed. Kick your target. If you hold the Control key it will kick your focus, instead. Cast gouge and immediately start bandaging. Works just fine when out of combat. One of the Draenor healing potions (Healing Tonic) will heal more and is instant, but will trigger your potion cooldown. 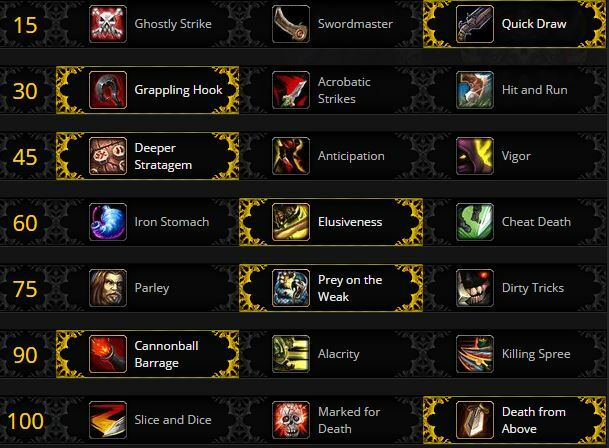 In Warlords all of the profession bonuses has been removed, along with those abilities you once had. So now the value of any given profession is what it always was, making useful items and/or making gold. Leatherworking can make some useful starter gear and Blacksmithing some weapons. It takes a long time to get the materials though. Best for cash, but still being useful? Pick two from Herbalism, Skinning, and Mining. Leatherworking – ilevel 640 armor pieces wearable at level 91, bags, tents that increase stats, some hats. Jewelcrafting – Create various useful gems, rings and neck items, and gemmed panther mounts. Blacksmithing – Can make some nice weapons. Alchemy – Ah, chemistry. No explosions, unfortunately. Make all sorts of flasks, elixirs, and potions, plus some transmutes. Enchanting – You can now enchant rins and necklaces for everyone, in addition to the regular enchants. Inscription – Crate glyphs, fortune cards, items for your magic using pals, and shoulder enchants. Tailoring – Make a nice flying carpet. Engineering – Lots of Engie gadgets have fun value, such as: rockets, gliders, shields, nitro boosts, funky mounts. Herbalism, Skinning, and Mining are use to either feed a profession or make gold. Note that Pandarens get twice the food buff. All food buffs last one hour and need to be reapplied if you die. Rogue leveling is easy. All specs work well, but Outlaw is more fun. Regardless of which build you choose you will find leveling to be pretty easy. Still, there are thousands of quests and a bazillion mobs to kill on the road to level 110 (not to mention other players, but they don’t count here.) Sorting out which quests are best and which series of quests will get you to 110 the fastest is another game, which is why we highly recommend Zygor’s Guide. Playing with Heirlooms and/or Recruit a friend? Gaining a few levels in the dungeons or in PvP? Zygor’s has your back. The guide knows what level you are and will correctly suggest where to go next. It will also dump all of your obsolete quests. And you will probably never need to look at your quest log again. Tnx for the info, but there is a typo i like to point out to u. In the txt there is eviscarate but u reallu mean Blade Flurry. when u put your mouse in it, it says blade flurry. Tengo mi pericia y mi celeridad al 7,5 ahora que stats subo? After you have your 7.5% Hit and Expertise you should go for Haste. Reforge everything that you can into Haste.